Y+B Blog | Yoga Classes in Oregon Breweries. Yoga + Beer. Yoga + Beer Blog. Tips for all levels yoga practice, newbie yogis, and living the hoppy life. Brewery yoga classes around Oregon and Washington in Salem, Portland, Albany, Corvallis, Silverton, St. Helens, Taulatin, Vancouver, Walla Walla and Woodinville. Sometimes our intestines can do a number on us. Or rather they get upset when we eat/drink whatever we want ;) Even if you’re feeling great, adding some spinal twists into your day isn’t a bad idea. To put it simply, twisty/stretchy yoga poses can help massage your internal organs. If something is cramped up, this just might bring you some relief! I’ve put together a few yoga poses to help you find full mobility again. A flow that enlivens and uplifts your day by wringing out the bubbles and the tightness. When you feel that tight spot, don’t push it. Try to get your body to relax and just breath to get any initial crampy areas to release. Maybe its your foot that is tense, maybe its your six-pack abs. ;) Just let your body get heavier and breathe. From table top (on your hands and knees) walk your hands forward and slowly lower your chest towards the ground. You can choose to land your chin or your forehead on the mat. Take the biggest slowest breaths you possibly can and just pause in this pose for at least a minute. You can feel free to do whatever you’d like in between these poses! A little cat/cow…down dog…a vinyasa, you name it! Staying in low lunge (option to lift the back knee up). With your right foot forward, bring your right hand down to the ground, a block or even a book works! We're just working at a gentle stretch in the left side to loosen things up a little more before some final twists. Repeat on both sides and try to prevent the hips from sinking down too much. Hopefully your body is feeling a little better at this point and you've got a little more pep to your step! Stay tuned for an upcoming video on a twist yoga flow. Cheers friends and enjoy your weekend! 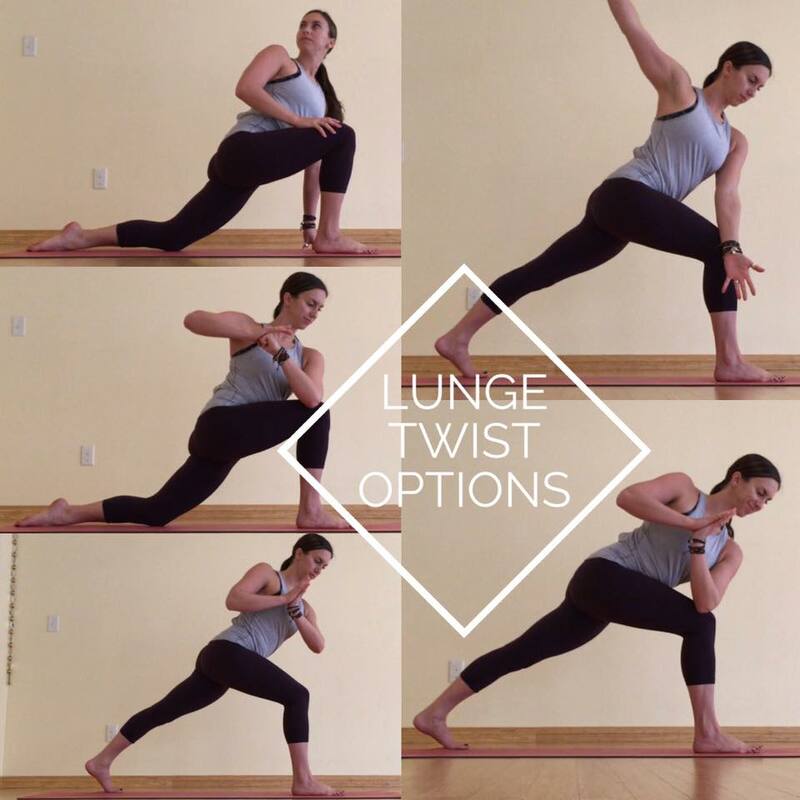 Lunge Twist. We include this pose in a lot of our Yoga + Beer classes. Sometimes it feels good to have this pose be strong and active, but sometimes you just want to relax a bit more. Here are 5 options for this pose that you can take anytime this pose is suggested in class. 1. Come into lunge with your back knee down, and your hand (same hand as front leg) pressing into the front thigh to spin your heart open. Other hand is on the ground (or your pint glass). 2. Same as Option 1, but a little deeper twist. Opposite elbow outside your front leg, create a fist with that hand and press into the fist with your other hand to help find the revolving action in your upper back. 3. Back knee off the ground, lean forward 45 degrees with hands at heart and start to rotate at the waist, bringing opposite elbow toward front leg. Stay here without trying to latch the elbow. 4. Start with Option 3, and then just open your arms. 5. The classic pose. Hands in prayer, opposite elbow outside front thigh, with back knee off the ground and back leg very active.